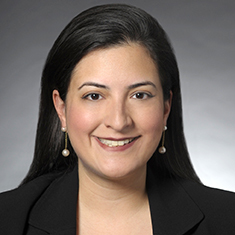 Jennifer I. Moscoso concentrates her practice on complex litigation and dispute resolution with a focus on the financial services industry. She represents corporate clients in government investigations, regulatory enforcement actions, arbitration proceedings and matters before the Commodity Futures Trading Commission, National Futures Association, Financial Industry Regulatory Authority and Securities and Exchange Commission. Experienced in the nuanced facets of discovery and motion practice, Jennifer has also successfully prepared defense strategies for disputes in federal and state courts. Jennifer participates in the Katten Legal Clinic at Jose de Diego Community Academy. Prior to joining the firm, she developed her commitment to superior advocacy as an associate in commercial litigation, specializing in employment law issues. While in law school, Jennifer worked for the US Department of Labor and was elected to the Board of the Legal Association for Women Students and the Hispanic Law Society. Jennifer is a graduate of the Leadership Academy of the State Bar of Georgia. Shown below is a selection of Jennifer’s engagements.